Chromogenix Coatest® SP4 Factor VIII is a chromogenic assay kit for the in vitro diagnostic photometric determination of factor VIII activity in citrated plasma. S-2765™ 15.4 mg + I-2581, 1 vial. Chromogenic substrate (N-a-Z-D-Arg-Gly-Arg-pNA), 15.4 mg, synthetic thrombin inhibitor, 0.4 mg, and mannitol added as a bulking agent. Reconstitute with 12.0 mL of sterile water or NCCLS type II water, to obtain a concentration of 2.7 mmol/L. Stability after reconstitution: 3 months at 2-8°C. Factor IXa + factor X 2.7 IU, 4 vials. Lyophilized bovine factors IXa and X with bovine albumin added as a stabilizing agent. Reconstitute with 3.0 mL of sterile water or NCCLS type II water. Stability after reconstitution: 12 hours at 2-8°C. The solution can be stored frozen in aliquots at -20°C (or at lower temperature) for 3 months. Do not refreeze. Buffer, stock solution 20 mL, 1 vial. 20 mL concentrated Tris buffer containing NaCl and BSA. Characteristics of tenfold diluted buffer: Tris 0.05 mol/L, pH 7.3, 10 mg/L Ciprofloxacin and 1.0% BSA. Dilute 1:10 (1+9) with sterile water or NCCLS type II water. Prepare a new buffer working solution each day. Once opened the buffer. Phospholipid 2 mL, 1 vial. Mixture of highly purified phospholipids and 10 mg/L Ciprofloxacin. Ready to use. Opened vial is stable for 3 months at 2-8°C. Shake gently before use. 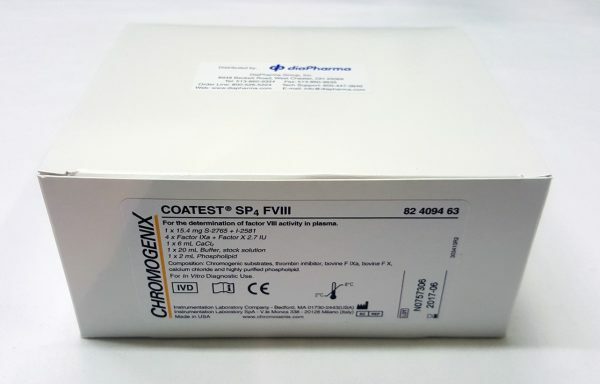 When kept at 2-8°C the sealed reagents are stable until the expiry date printed on the label. Contamination by microorganisms should be avoided once the vials are opened.